The journey toward Niigata prefecture takes about 2 hours via the Joetsu high-speed bullet train from Tokyo station—located 30 minutes from Haneda Airport. Our journey started at Murakami City, a castle township located just slightly north of Niigata City. Located right outside Murakami Station, the Nippon Rental Car Depot is where you should first visit to kick-start your Niigata road trip proper. The staff may not be able to communicate in English effectively but they do have pamphlets available in multiple languages. Renting a car for a day is not very expensive either with a decent, standard car costing as little as 7000 yen (approx. S$85) for a day. It comes in mint condition with a navigational device in English. Once you’ve gotten your car settled, you could probably do with some grub and located just a short 5-minute drive away is Yururi Restaurant. Off their lunch set menu, you can find anything from rice bowls to soba, each of which features seasonal meat, fish and vegetables—a great way to taste a good variety of what Niigata can offer in terms of its products in just one meal. We got ourselves the Tendon and Kaisen set, both of which came with a bowl of soba noodles in addition to rice. Fresh-tasting and decently priced, our first meal in Niigata kicked off pretty darn well at Yururi. If you’re a sucker for salmon, you’ll be thrilled to know that Murakami is famous for the stuff due to its proximity to Miomote River—a salmon hotspot basically. In fact, salmon has been a key element in sustaining the city’s financial backbone ever since the Edo period which explains why the people there are insanely proud of it. Here in Murakami, there are over 100 different ways that the natives prepare salmon with the most common being salting and dry-curing, relying on the natural wind from the coastal breeze. The Murakami township is popular for their green tea and black tea varieties and you’re more than likely going to have no trouble finding a tea shop tucked in a corner somewhere. It might seem intimidating from the outside but don’t be shy and just waltz right in, the locals are extremely friendly and will do their utmost to serve you well despite the language barrier. You can get the full tea-drinking experience with the added bonus of having your tea brewed over charcoal and an expert to prepare, serve and educate you about traditional Japanese tea and the art of tea-drinking. For just a small fee, you get to go on a 45-minute boat ride meters away from the coastline to have a better view of the natural landforms as well as feed seagulls while you’re at it. Notable landforms include the Lion Rock, Eagle’s Nest and Dinosaur Rock. Upon docking, be sure to stop by the fisherman’s wharf, where fresh fish is caught, treated and cooked fresh on an open grill. Fortunately for us, we arrived just in time to savour some fresh local ebi that was literally caught and carried off a fishing boat minutes prior. The thought of having a vegetarian meal in Japan might not appeal to many. In fact, some might find it a waste, but over at Doyuno Veggie-Time Restaurant, your impression just might change. This is a proper as farm-to-table dining goes with all of the restaurant’s menu offerings coming straight from the farm. The experience starts off with a tour of the vegetable garden, of which guests will be educated on the different varieties of vegetables and herbs they grow, before letting you indulge in them all back at the restaurant. Every recipe is designed specifically to the taste of each individual vegetable so depending on which season you visit, you just might have a different menu every other day. As history has shown, the people of Tsuruoka have been and are, until today, incredibly reliant on vegetables for sustenance, largely because of their historical ascetic practice of Buddhism which disallows them to indulge in meat-based food. Fancy a scenic trek through a thick cedar forest? The path leading toward Mt. Haguro is excellent and is a popular spot for both locals in search of a spiritual escape or simply just folks who’re looking to get some exercise in. The lush greenery and the still, tranquil atmosphere is a pleasure to take in and is definitely a spot we recommend if you’re looking to get some solid portrait shots of yourself taken. The spiritual charm of the place comes in the form of shrines and little totems scattered all around the forest with a massive 5-tier pagoda located slightly deeper within. The Kamo Aquarium in Yamagata Prefecture is in the Guinness Book of World Records for housing the world’s largest collection of jellyfish. Peculiar yet beautiful creatures nonetheless, a trip here will not be wasted. However, do note that the aquarium closes at 5pm so plan your time carefully if you do not want the drive down to be in vain. If you’ve always had a fascination for Japan’s ancient warriors, the samurai, then perhaps a tour through the Uesugi Shinto Shrine should be right up your alley. Upon arrival, we were greeted by a quartet of samurai role-players, who, not only looked the part but also sounded and behaved like the proud samurai warriors of Edo-period Japan. From learning to purify your body, to submit an offering to the Gods, the tour covers it all—if you dare to ask, they’ll probably even let you hold their weapons. The tour ends off with a 15-minute-long skit featuring the samurai warriors. Craving something authentic and exclusive to the Niigata prefecture, we were brought to try a local delicacy called Wappa Meshi at Inakaya Restaurant at Furumachi Old Town (basically the restaurant where the dish was born). Wappa Meshi is a steamed dish consisting of steamed rice cooked using dashi that is topped with meat, or seafood cooked. It is steamed in a wooden box, similar to Chinese dim sum and the beauty of it is that the process allows for allows for the flavours of every component to marry well with one another. The box itself, otherwise known as the ‘Mage-Wappa’ is a kind of container which was used as a lunch box by the folks who worked high up in the mountains and has been a tool of transporting food for over 600 years now. We had a variety with some comprising chicken, salmon, ikura (salmon roe), local ebi and more. Every Wappa Moshi was cooked to utmost perfection and albeit looking simple, they each boasted incredible flavour. Anyone who’s anyone in the food industry would know of Japan’s highly acclaimed Tsukiji Fish Market—the home of some of the world’s best seafood. Well, in Niigata city, they have one similar called Pia Bandai. The market stocks a considerable amount of Niigata speciality products such as rice, vegetables, fruits, sake, local fish, tidbits and more but its main appeal would be its wide array of fresh fish and seafood offerings. From unbelievably affordable uni (sea urchin) to thickly cut sashimi prepared fresh upon order, any seafood lover would be excited. The Northern Culture Museum once belonged to one of the wealthiest family of landowners or ‘farmer lords’—as the local people refer to them as—in the Echigo area. However, it has long changed and while the massive complex astounds with its rustic, well-kept furnishings, perhaps one of the more interesting facts to note is that it is the only one in Japan that still stands. You’d have to go on a tour for the full explanation but we promise you this is far more interesting than some mere museum walkthrough. The owners of the house were huge in the rice farming industry and provided rice of exceptional quality to all parts of Japan. Located in Cocolo at Niigata Station, you’re bound to stumble upon a sake speciality store—Ponshu-Kan—right smack in the middle of it. The prefecture is known for their rice, so it is only natural that they’d be home to outstanding sake as well. Skilfully brewed with high-quality rice and spring water from the mountains, much of their sake take on a clean and refreshing taste. At Ponshu-Kan, visitors can taste and sample their fill of all the major sake brands (¥500 for 5 samples) in Niigata and with more than a hundred labels to choose from, chances are you’ll be there for quite a while. It’s one thing to buy fresh fruits from the supermarket, let alone a farmer’s market, but to actually be able to pick your own fruits with your bare hands? That really is a killer experience. When in Niigata, you should definitely try your hand at fruit picking at the Shirone Grape Garden. With grapes in the summer, pears in the fall, strawberries and more during winter through spring, this lovely fruit orchard allows you to enjoy fruit-picking all-year round. Their popular gelato is made using the seasonal fruits that they grow onsite too and if you’re a fan of Japan’s esteemed Kyoho grapes, you’ll be glad to know that you can pick those here too (or have them in gelato form). Considered Niigata’s national park, this vast and beautiful park is popular for numerous reasons. On weekends, the park is open for people to have barbecues and picnics and is also a great place for photographers and fitness gurus. 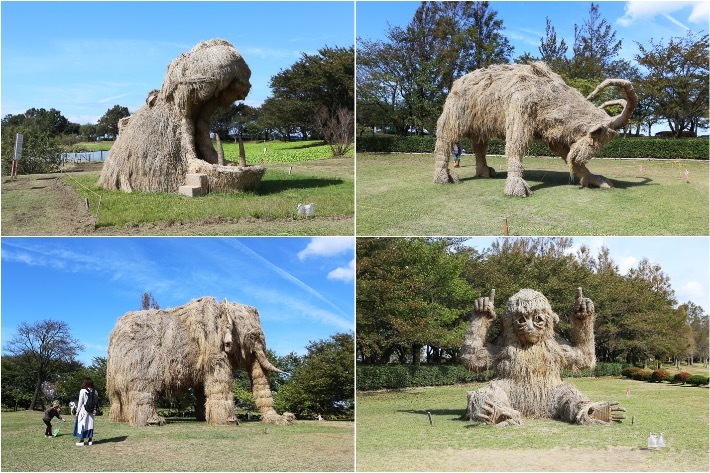 During the spring season, the park itself is said to boast spectacular displays of cherry blossoms but during other parts of the year, the park also plays host to a myriad of artistic sculptures and the ones that we were fortunate to see were the animal ones made using rice straws. When in Japan, to eat any cuisine other than Japanese cuisine would not the most ideal, but we beg to differ, or at least at Kokajiya Restaurant. Fusing together Italian recipes and culinary techniques but relying heavily on local produce derived from Niigata itself. From their pasta to their mains, all of their food nicely tie together the best of both cuisine’s culinary disciplines and flair. The result? Possibly one of the best Italian dishes we ever had. Period. To round off your trip on an epic note, there’s nothing quite as majestic as a stunning sunset view a couple of hundred metres above sea level. At the Yahikoyama Rope Way, not only were we treated to a gorgeous 360-degree view of the land below, but the sunset—coupled with the mountain breeze—marked one heck of a solid end to our 5D4N adventure in the Niigata prefecture of Japan. This post was brought to you by Niigata City, Murakami City, Tsuruoka City and Yonezawa City.